When Apple first previewed what was then called iTV back in September 2006 and later unveiled Apple TV at January’s Macworld Expo, there were oohs and aahs—and also complaints. The most commonly-heard gripe: the device’s “limited” functionality. Specifically, some people were bothered that Apple TV could only play few video formats or that it didn’t have enough features for advanced users; others thought that the device’s 40GB hard drive was too small. Those criticisms continued, even as Apple TV began shipping to customers. But then something happened: People started receiving their Apple TVs, and some of those people—including myself—started taking them apart. In fact, within days of the first Apple TV being delivered, new sites sprung up focused on hacking the set-top box. It turns out the Apple TV isn’t so “limited” after all—at least not when it comes to the hardware inside. The fine folks over at AnandTech went above and beyond my basic disassembly by completely dismantling their Apple TV to find some interesting stuff inside. For example, after a bit of sleuthing, they deduced that the Intel chip in the Apple TV is an “Ultra Low Voltage Pentium M based on the Dothan core, running at 1GHz (max frequency), 400MHz FSB and a 2MB L2 cache.” The Apple TV also includes 256MB of RAM and an NVIDIA GeForce Go 7300 with 64MB of dedicated video RAM; the latter, a laptop-focused GPU, isn’t exactly a barn-burner, but it’s more than capable of handling HD video. More interestingly, the audio chip in the Apple TV is a Realtek ALC885, which the manufacturer describes as a “7.1+2 Channel High-Performance High Definition Audio Codec.” The specs on this chip are quite impressive, and seem to indicate that the Apple TV’s reported audio-output limitation—Dolby Pro Logic II—is due to software, not hardware. In fact, Roughly Drafted reports that if you play a sample DTS audio file through your Apple TV, the Apple TV’s optical digital-audio output jack does indeed put out 5.1 audio. On the other hand, the ALC885 also supports “advanced lossless content protection technology,” so perhaps we have hardware DRM in our video-playing future. On a software note, Apple TV runs a version of Mac OS X; version 10.4.7 Build 8N5107, to be exact. It also turns out that, Apple’s statement notwithstanding, connecting a keyboard to the Apple TV’s USB port does do something. Specifically, you can boot the Apple TV into single-user mode by holding down Command+S at startup—you can’t do much from there, but it’s still interesting—and you can enable Verbose startup mode by holding down Command+V at startup. Related to the previous two items, one other neat trick that’s been discovered is the ability to boot the Apple TV off a USB drive. In the video below, a clever Apple TV fan uses Recovery mode to reboot his Apple TV from a USB hard drive containing a copy of the Apple TV’s own hard-drive contents. An enterprising Apple TV owner, Ozy from awkwardtv.org , booting the Apple TV off a USB drive. Meanwhile, an entire community of Apple TV owners/hackers is busy trying to clear perhaps the highest hurdle of all: support for other video/audio formats. The largest such gathering appears to be an ever-growing forums thread over on Something Awful documenting these efforts. As it turns out, given that the Apple TV is running a version of Mac OS X (10.4.7, as mentioned above and documented in that Something Awful thread), adding support for other formats isn’t difficult. The Apple TV software uses QuickTime for handling media, so if you remove the Apple TV’s hard drive and connect it to a Mac—for example, by using an external hard-drive enclosure or a connector such as Newer’s Universal Drive Adapter —you can navigate directly to the /Library/QuickTime folder on the Apple TV drive and install third-party plug-ins such as Perian. (Perian adds support for formats such as DivX, FLV, AVI, XviD, and many others.) You can also install Flip4Mac’s Windows Media Components for QuickTime on the Apple TV drive to add support for WMV content. Alas, even if you perform the above procedures, you won’t suddenly be able to view files in these new formats on your Apple TV. Just because the Apple TV supports other formats after such modifications doesn’t mean iTunes will sync media using those formats to the Apple TV. You see, iTunes is still the gatekeeper of Apple TV content, and it still thinks the Apple TV is limited to its stock format support. Interested in other tricks and hacks? How about running the Apple TV software on a MacBook ? Or enabling Remote Desktop/VNC on your Apple TV? Or running Apache (the open-source Web server used by Mac OS X for Personal Web Sharing)? These are just a few of the things people are doing... because they can . We’ve already tinkered with displaying Keynote and PowerPoint presentations through Apple TV and plan on trying out some of these other hacks ourselves—as well as looking into a few new ones—in the coming weeks, so stay tuned. Clearly, the Apple TV isn’t as “limited”—at least not by hardware—as many people originally feared. The question now is whether Apple will embrace, or at least turn a blind eye to, this hacking community, or spoil the fun like Sony does with its PSP (each new software update for the PSP breaks “homebrew” software and features). With any luck, the Apple TV will become a favorite toy of hackers as well as an ever–improving product, thanks to software updates from Apple that implement some of the most-requested features, for the rest of us. 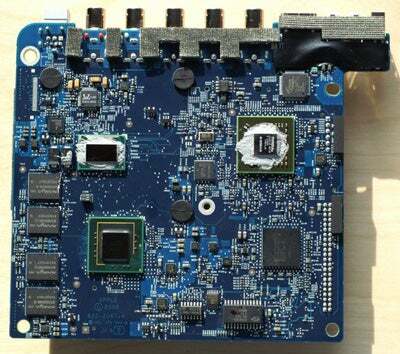 This article was reposted at 11:18 a.m. PT on March 28, 2007 to add images of the Apple TV motherboard.